Sync Ops is a simple to use network file/folder synchronisation tool. 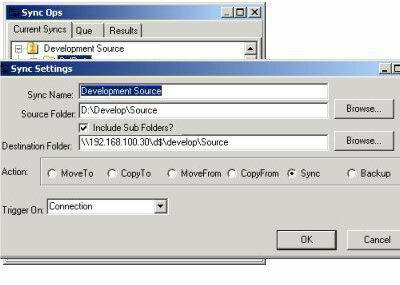 Besides synchronisation there is the option to move/copy from source and destination folders and do a full zip backup. Sync Ops is now free software, to unlock your copy and enable the synchronisation of large files please use the free unlock code provided below. This program will no longer be updated, for an excellent synchronisation alternative to Sync Ops please have a look at Synchromat file synchronisation software. Synchromat synchronises files among all your computers, and their local, network and removable devices, ensuring that you always have your most current files wherever you are. Use it to synchronise all your documents, photographs, MP3 music library, software archives, contacts, e-mail and any other type of data file. Unlike other synchronisation applications, Synchromat performs true 2-way synchronisation, the collected file metadata not only enables propagation of file and folder deletions to the synchronised folder, but also guarantees correct detection of all file changes. The multilingual user interface is available in more than twenty languages. Additional features include scheduled synchronisation, automatic synchronisation when a USB device is connected or when files are changed, one-way (backup), 2-way and n-way synchronisation, file and directory filters, statistical reports and much more. You can order your copy of Sychromat by following the link.